Chris Teague (Obvious Child, Landline) talks going back to Red for Russian Doll, futzing with split diopters, and the difficulty of balancing a personal life with a TV series schedule in my latest interview for Filmmaker Magazine. 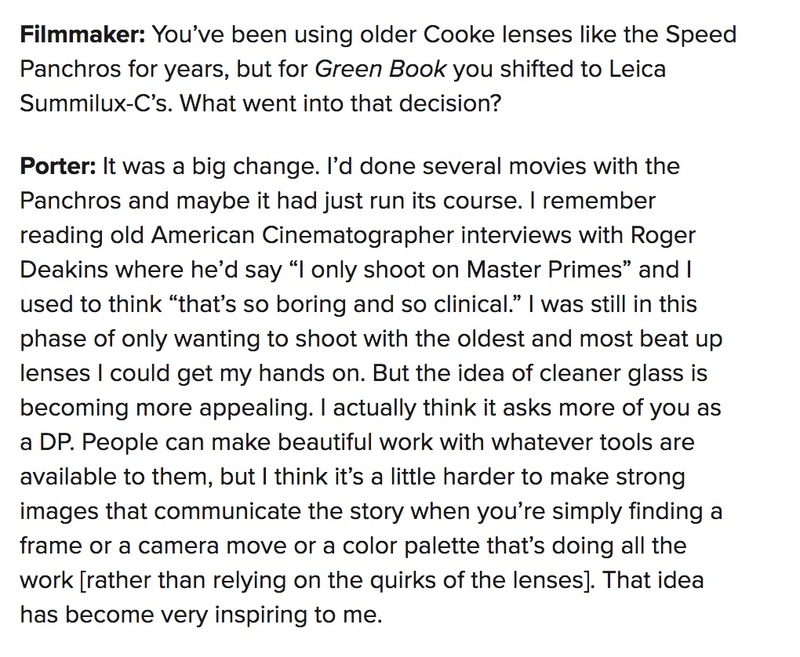 Here’s an excerpt, with Teague discussing his use of Leica Summilux lenses. 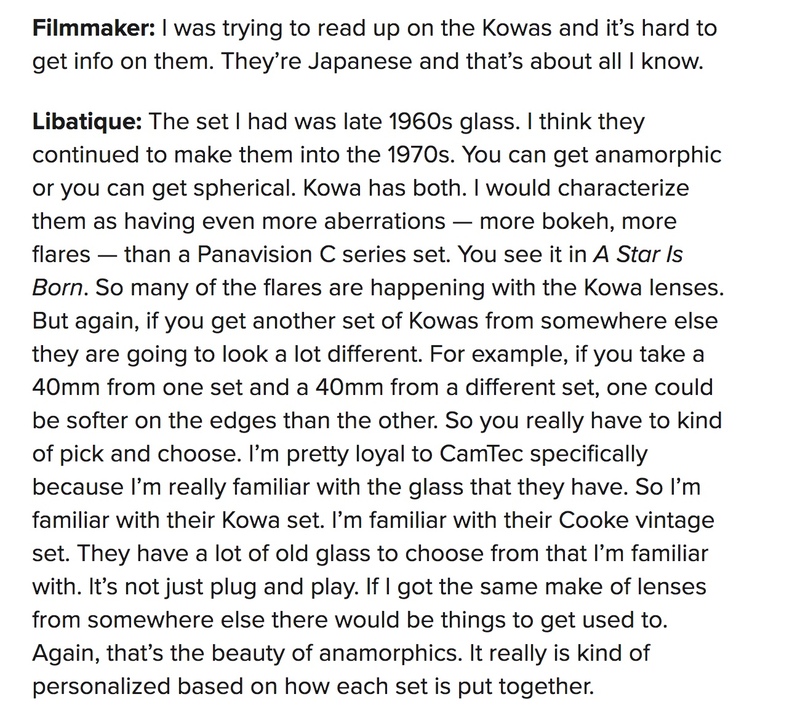 Filmmaker: You owned a set of Cooke Speed Panchros for years, but for Russian Doll you went with Leica Summilux lenses. Teague: Yeah, I shot almost everything on vintage lenses before Russian Doll. They didn’t feel appropriate for this except for the flashback sequences in episode seven, which we shot on Super Baltars. This felt like a modern, contemporary, hyper-real landscape and I loved the idea of having super fast lenses that I could shoot wide open all the time. The concept in my head, which is maybe too literal, was that Nadia was out of step with her world, and if we used fast lenses with very shallow depth of field she’d always feel like she was popping out of her background. I really fell in love with how those lenses look. The wide lenses [have minimal distortion], so we could do some things on super wide lenses. I shot a couple of scenes on a 16mm lens and I never would’ve done something like that before. I love a wide lens where you have that incredible open field of view, but you’re not so distracted by the way it’s warping the space. The Leicas are fantastic lenses. They’re also small and light, so we could keep the camera’s [footprint] smaller. That was a plus when shooting in tiny New York locations. 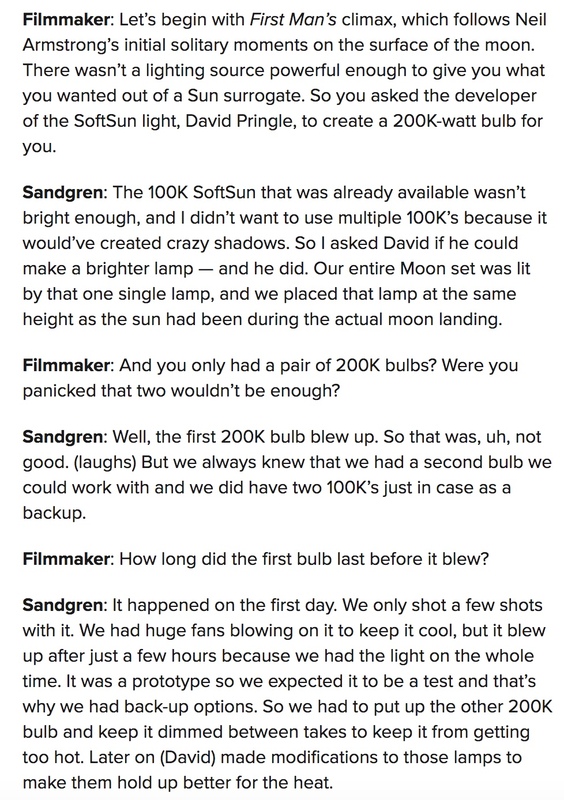 Here’s a link to my latest piece for Filmmaker Magazine – an interview with First Man cinematographer Linus Sandgren. The Neil Armstrong biopic was shot on a mixture of Super 16mm, 35mm and 70mm IMAX with many of the effects created practically in camera by placing spacecraft replicas on gimbals in an Atlanta soundstage decked out with giant LED screens. The climactic moon scenes were shot in an Atlanta quarry and lit entirely with one 200K bulb created specifically for the film. Production had only two of the prototype bulbs – one of which blew on its first day of use. A snippet of the story is below. Also, check out my previous talk with Sandgren about his Oscar-winning work on La La Land. Check out my interview for Filmmaker Magazine with Darran Tiernan, who lensed five of the ten episodes of Westworld’s second season. 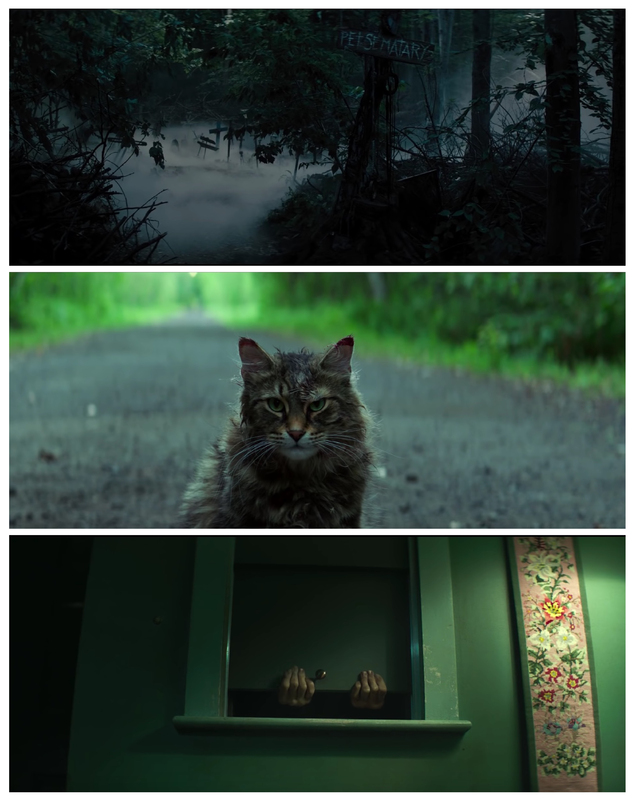 Shot on 35mm with Arri Zeiss Master Primes and 75mm-400mm Fujinon Premier zooms. Filmmaker: At this point I’m only through episode 3, which ends in a large scale battle between Delos security forces and a band of hosts holed up at Fort Forlorn Hope. How difficult is that scale to achieve on a TV schedule? Tiernan: That battle sequence was shot over three days. Most of the real big battle scenes were shot on one massive day where we had seven cameras. We shot one direction in the morning, we shot another direction mid-day and then another direction in the evening. The next day we blew up the field in front of the fort. We had to plan it like a proper battle, deciding where every camera was going to go for each sequence. It was quite a phenomenal thing to be involved in, with so many departments all in sync in order to pull it off in the time that we had.